When a client walks into the Pret-a-Porter, which is French for “ready to wear,” she is greeted by a light fragrance similar to herbs growing in the garden. 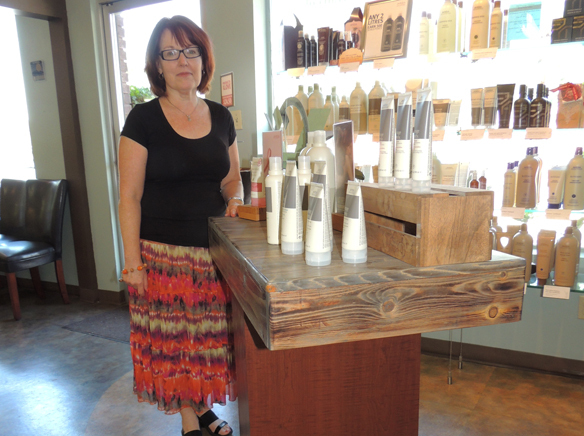 “That’s the fragrance of Aveda’s line of products,” said Arlette Leggitt, manager of the salon. Another fragrance also emanates from the sanded and polished wood of the salon’s newly refaced furniture. Yet the furniture is not of mahogany or other expensive wood. “It’s pallet wood,” said Roz Oserin, owner of the salon. Oserin rubbed the masterfully stained and polished wood on the front desktop. Roz and Dan Oserin, owners of the Pret-a-Porter in La Mesa, have set a new trend in stewardship. They believe that a new kind of beauty comes from taking care of the earth. Oserin came across this novel way of re-facing the salon’s furniture last year after she had repainted the salon walls and upgraded all the spa equipment. She still needed to change the furniture color on the front desk and other pieces in the salon. Rather than buy new furniture to replace the old, which would have ended up in a landfill, Oserin looked for alternate ways for an ‘updo’ on the salon. They kept in mind the salon’s own mission: To provide the finest salon and spa treatments in a relaxing and friendly environment while serving our community, our team, and our Earth. For the Oserins, this mission statement means that they would include the purchasing, using and selling retail products that support the environment. That is why they carry Aveda, one of the top ten green companies in the world, powered 1005 by wind power. So last May, when Roz came across an ad for reused pallets at Reconstruction Warehouse in San Diego, she met owner Chris Merek and was impressed with his work. “What caught my eye in the store were both the rustic looking furniture and the wall treatment made from pallet wood,” she said. Merek and his staff resurfaced four pieces of furniture and the front desktops in Pret-a-Porter with the pallet wood, burning it to create a rustic look and staining it to complement the existing furniture. The stylists at Pret-a-Porter love the new look of the salon as much as the clients do. “This idea will catch on business by business, with Roz being in the East County Chamber,” said stylist Alva Estrella. Oserin said that she believes in the full circle of life, that what goes around comes around. “I believe when we help others, and support those that we work with, that it all comes back to us, creating a great environment to work in and a wonderful world to live in,” she said. In the next month, the Oserins will be doing more upgrades in the salon’s bathroom. The walls will be refaced with the same pallet wood to bring the design idea full circle. Stylist Samantha Vickers appreciates the distinction, too. Vickers said that working at Pret-a-Porter has opened her eyes to the concept of recycling and using organic products. “Now I find myself being more thoughtful of the world and environment, too,” Vickers said.